Bespoke Shutters can supply and install a full range of shaped shutters to fit nearly all sizes and shapes of window. As well as our extremely popular range of full height, tier on tier and café style plantation shutters, we can also produce shutters in a wide range of shapes and sizes. Special or unusual shutter shapes include the half round, the eye brow and the elongated half round, the quarter round, the circle, hexagon, octagon and the triangle. Sunburst designs can be incorporated into arches or sit atop T posts or a divider strip. The half round plantation shutter is protractor shaped. It is often referred to as the sunburst because it resembles the shape of the sun as it is rises or falls over the horizon. The louvres within its semi-circular frame further add to this sunburst effect as they look like the rays of the sun, emanating from its centre. The eyebrow shutter is a shallower version of the half round, extending further out to the sides. It will better suit the wider window apertures. The elongated half round shutter is a shallower version of the half round with either side cut off square providing right angles to both sides. One quarter of a circle, the quarter round window shutter is perfect for the continuation of the shutter look over doors with windows of this same shape. The circular window shutter is ideal for covering porthole windows. 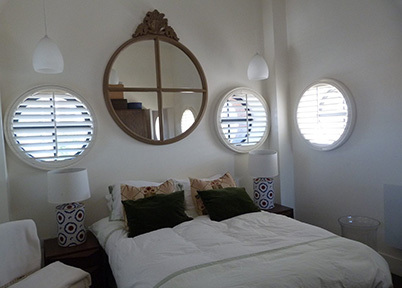 The hexagonal and octagonal window shutters are quirky conversation pieces that fit into circular porthole apertures. The triangular window shutter is ideal for those circular, hexagonal or octagonal conservatories whose roof tops rise to a pinnacle in the centre. 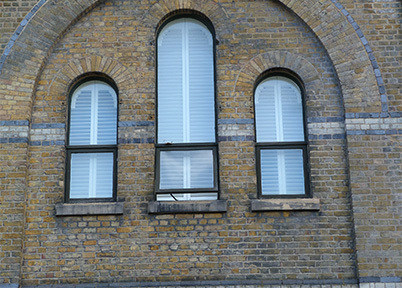 Probably the most common of shaped apertures, shutters for arched windows can be constructed in a variety of ways. They can be made with a dividing strip separating the sunburst from the vertical in 2 sections or they can be made to incorporate a T bar. This separates the shutter into 3 sections; a left vertical, a right vertical with the sunburst or half round on top. Another equally popular option for arched apertures is the multi panelled angled archway, a two piece arrangement, it opens to the left and right. What is the full range of shaped shutters that are available? Aside from the full height, the café style and the tier on tier range of shutters, the range of shaped shutters includes; The half round shutter, The eyebrow shutter, The elongated half round shutter, The quarter round window shutter, The circular window shutter, The hexagonal window shutter, The octagonal window shutter, the triangular window shutter and the arched window shutter. Is there any type of window that can't be fitted? We haven’t come across one yet.